One of my fondest colleagues and a superb teacher of American History, Carol Sweigert, always assigned this book as required reading for her classes. For parents with middle to high school aged students of history, it is an easy reading chronological account of the founding fathers, the founding communities, and the solid faith that came with these early Pilgrims. One can read hundreds of so called “facts” about the founding fathers not being Christians, mostly being painted as Deists. Deists did not accept the Scriptures as revelation from God or as His Word, nor the depravity of man, nor Divine providential intervention, as the authors point out.1 Marshall takes Washington’s own letters with quotes that reveal his firm Biblical foundation which was far from the Deistic philosophy modern writers claim for Washington. Washington Kneeling at Valley Forge, a picture commissioned to artist Arnold Friberg during the 20th Century, has fallen into the modernist’s disdain for all things sacred. Yet there are numerous quotes from contemporaries of the great general who wrote of seeing Washington on his knees in private prayer. This text gives readers the reasons for the suffering our early founders endured. That is, they fought to gain a freedom no other country could give them. I remember admonishing a parent once when he complained that I was brainwashing the students with “Christian anecdotes” like the one above. I readily agreed with him that I was brainwashing. “Every parent brainwashes his child with his closely-held philosophies,” I said; “It is just a matter of what you want your child’s brain washed with.” The parent agreed with me on that point. 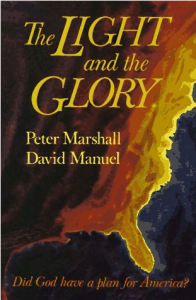 The authors give the source for each statement about the Christian founders while telling the intriguing story of the separation from England and the struggle to establish our new country.